Libby’s may be the best-known brand of pumpkin for pumpkin pies, but we’d like to make sure they’re known for something else: deceptive labeling. Despite containing only “100% pure pumpkin” in their cans, Libby’s proclaims “No GMO Ingredients” on their label. What they’re not saying? Genetically modified pumpkins don’t exist, so this label only touts a distinction without a difference. Talk about pie on your face, Libby. 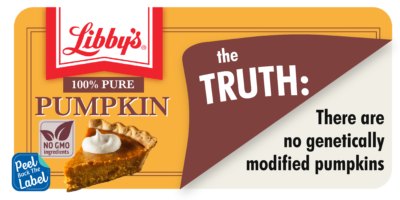 Tell Libby to stop preying on their customers’ fears and misconceptions and use only truthful labeling on their canned pumpkin by Tweeting, posting to Facebook or writing to them today.